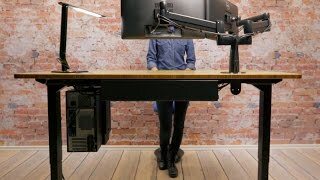 Upgrading to a sit-to-stand desk can be revitalizing to your workflow. But look under your desk to find disordered cables and cords, and you might start feeling a little unwound. That's why we have the UPLIFT Adhesive Readjustable Cable Tie Mounts, to keep the cables off the ground and to improve desk organization instantly. Adaptable, reusable, and secured with 3M adhesive, you can organize your desk to your liking, freeing you from the chaos that loose cables can cause your workstation. Finally, no more tangles, no more snags. Available in 10, 50, or 100 piece sets, you can use these handy tie mounts for workspace organization, stereo cords, you name it. Handy when you have them, regretful when you don't, you can't go wrong with this crucial desk accessory. UPLIFT Adhesive Readjustable Cable Tie Mounts are available in sets of 10, 50, or 100, to accommodate projects large and small. Buy extra and use them around the house, in the car, or in the garage! Get your accessories shipped to you quicker by adding our expedited production option. Order by 3 pm Central on a business day and your order will ship out of our warehouse the same day. If placed after 3 pm, your order is guaranteed to be shipped the following business day. $8.99 List Price: $10.00* The list price is the same as the MSRP (Manufacturer's Suggested Retail Price). It may not necessarily be the price at which the product is sold.